Click HERE to see a larger version of this photo. 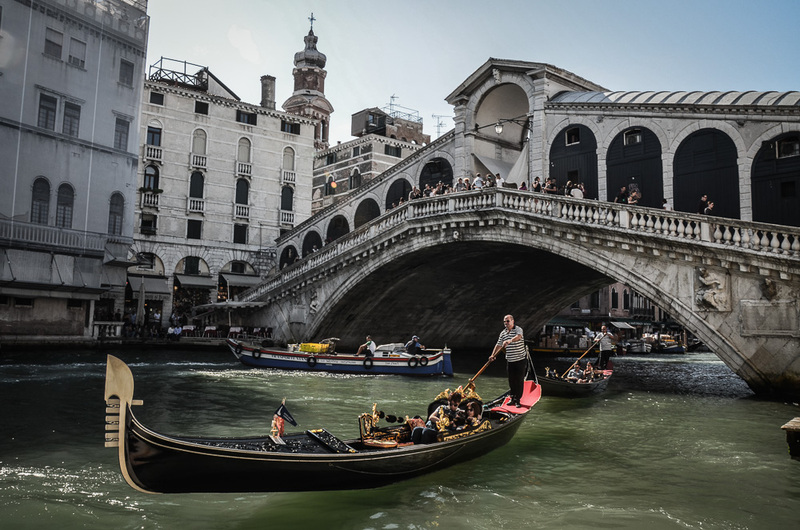 First up, one of my favorite photos taken near the Rialto Bridge in Venice, Italy–a gondolier navigating the busy waters of the Grand Canal. I was surprised by how crowded this waterway was. It was packed with tourist-toting gondolas and sightseeing boats, transit ferries packed with people, and industrial and commercial delivery barges hauling all manner of things (e.g. toilet paper, concrete, furniture) to the businesses in the old city. It really is a uniquely Venetian version of an urban highway! How was your week? I’m still catching up on things at work that I put on hold until after our trip, and finishing articles due to other publications–I’ll share them here when they are up! In between that, I’m editing the rest of my trip photos and working on a long overdue website redesign so that I can start to use bigger photos in my posts, and not resort to silly tricks, like above, to show you decent-sized images. This weekend, I’m meeting up with a good friend I haven’t seen in a few months, going to a Halloween party for a nonprofit I volunteer with, and (if I finish the things I need to do this afternoon!) joining Kevin tonight at my first UC Berkeley tailgate of the year. I’m not a fan of football, but I don’t mind a good tailgate. More Italy/Malta/Netherlands photos and stories coming soon. Have a great weekend! Venice is a classic. I love that gandola! Such a perfect shot.